As my gesture towards Cixous at the close of my last plateau suggests, I am also particularly concerned with embodiment in Eikon Basilike. Issues of materiality and embodiment in this work have by no means been critically ignored; it would seem that nearly every critical study of it over the last decade or so has pointed to materiality and the visual as blind spots in the scholarship, yet I have difficulty finding criticism on this text that does not look to, or focus on, these issues. What follows is a brief study of the literature surrounding Howe’s engagement with print materiality and a poetics of embodiment in which I hope to divert this critical attention from its traditional preoccupation with mimicry and historical violence and towards an understanding of Howe’s work, especially in Eikon Basilike, as drawing from a tradition of concrete poetry. In particular, I wonder if reading this long poem as walking the line between lyric and concrete “constellation”—the seminal concrete poet Eugen Gomringer’s term for concrete poetry’s deviation from the traditional “line” of poetry—may help us to reveal its postanarchist radical potentials. Before I get into the issues of reading Howe as a kind of concrete poet, I want to look at how materiality, the visual, and textual embodiment are typically discussed in the scholarship surrounding Eikon Basilike. To begin, many articles, like the one I have discussed throughout these plateaus by Mandy Bloomfield, treat this long poem as at once icon and iconoclasm. For Bloomfield, for example, the text functions in its digressions from typical lineation as a visual mimicry of real, lived violence as well as textual violence. Bloomfield consistently employs the language of mimesis in her discussion, arguing at one point that “the disrupted page echoes or even mimics historical violence” (418), something that, recalling my last plateau on hauntology, foregrounds “the haunting power of the icon” (424). For Bloomfield, there is an implicit link between the iconoclasm of Puritanism, of Milton, and to an extent of Howe’s own work, and violence. That is, iconoclasm’s violence against the icon necessarily enacts a violence against the represented object, a violence that both Howe and Bloomfield connect to a politic of colonialism and othering (426). Bloomfield points to those moments in Eikon Basilike where violence is visually or pictorially gestured toward: the disruption of the image of the throne on page fifty four, for example, or the staggered reproduction of the steps to the guillotine on page fifty-nine. And, as I mentioned in my previous chapter, Bloomfield likens the toppling “O lord” in the epigraphic poem as a tilt that mimics both prayer and decapitation (428). And yet, she also understands, if she does not explicitly state it, that Howe’s work functions in a much more complex way than simple pictorial mimicry; instead, the text literally embodies dispersal and discontinuity rather than merely representing or expressing it. This is what Bloomfield gestures toward when she attributes a kind of “agency” to the “specific shapes and arrangements” on the page that, she argues, essentially act upon the reader (422). Many other critics in their discussions of mimicry and visual representations of violence similarly employ the rhetoric of embodiment in their discussions of what they conclude is representational or pictorial. In her discussion of the eye-witness in Eikon Basilike as a visual element, Kathleen Crown gestures towards a reading of eye-witness as embodiment (500), arguing even that in linking iconoclasm to historical and colonial violence, Howe “absorb[s] the rhetorical violence of iconoclasm into her poem” (497). Uta Gossman, in her study of Howe and textual memory, argues that the visual dischord of the poem mimics violence as well, but uses a metaphor of theatricality to gesture towards Howe’s radical materiality. She writes that “Howe designates Eikon Basilike … as a dramatic poem with voices moving on the stage of the page. In Eikon Basilike, the typography is meant to express visually the violence of King Charles I’s death as well as the theatrical aspects of his execution” (98). While none of these critics directly address these moments of radical poetic embodiment, all of them understand quite clearly that Howe’s refusal to dematerialize text, her reorienting of the telos of language, is a political (and explicitly gendered) act of historical rewriting. Understanding Howe’s work, and Eikon Basilike in particular, as a process of rewriting or overwriting has become du rigueur in the criticism, emblematized by Michael Davidson’s designation of her work as “palimptext.” The readings of Howe as rewriting tend to fall into two related camps: historical rewritings of authority, and gendered rewritings of history. In the former, Marjorie Perloff has led the charge, arguing that Howe’s texts work not against history and tradition, but rather in what she terms “collusion” with them. For Perloff, this rewriting is both metaphorical and literal, arguing that through a complex interplay of embodiment and abstraction, Howe’s collusion with history leaves the text “wounded” (530). In the latter, the most cohesive study of gendered rewriting and its intersection with materiality is Alan Golding’s contribution to We Who Love to Be Astonished: Experimental Women’s Writing and Performance Poetics in which he argues that “Howe’s poetics associates the feminine with rupture, gaps, erasure, absence—visually with various forms of fragmented text or ‘empty’ space” (159). And, to be sure, the criticism surrounding Howe has been particularly interested in these gaps and absences—my last plateau obsessed over them. But, it would seem that an interest in absence and materiality is a contradiction. Thus, Golding appends this argument with the important caveat that while concerned with absence and erasure, “Howe constructs her ‘feminine [and feminist] accomplishment’ in and out of far from empty space” (164). What both Perloff and Golding insist in their reading is that Howe’s interest in the dispersal of otherwise coherent textual elements requires rethinking the reading process. In Howe’s ‘words,’ our criticism needs “A p i v o t” (56/7). In order to rethink these overwritings and absences, we need to turn our interests from erasure and towards what precisely fills these spaces. For Elisabeth W. Joyce in “The Small Space of a Pause”: Susan Howe’s Poetry and the Spaces Between, the primary concern of Howe’s work is absence, the spectral centres from which her writing reconsiders dominant structures. But, she does insist that we also look to the materiality of print and the visual elements of the page in order to rethink Howe’s textual organization. Also gesturing towards a poetics of embodiment, Joyce argues that “[t]here are moments in Howe’s poetry where letters become so divorced from their word groupings that they begin to be only letters” (116). As in the “p i v o t” quoted above, this interest in letters as “only letters” surfaces quite clearly in Eikon Basilike. It is this interest in the materiality of language that concerns Craig Dworkin, too, who acknowledges that Howe herself is always primarily interested in “poetry as a physical act” (31). Dworkin concedes that, of course, letters as functions of a larger linguistic structure cannot escape the processes of representation and expression that govern language. Nonetheless, he asserts that regarding poetry as a physical act allows us to reconfigure our manner of reading, focusing on the visual and material over the communicative. “The material text,” he writes, “cannot ever completely escape from the republic of signification; it simply crosses the border from the canton of ‘literary’ to that of ‘visual’ art” (48). In this way, Dworkin’s analysis recalls the interests of the first concrete poets, who similarly worked to distance material language from its signifying function. Dworkin does argue that “Howe’s writing is generally not … shaped, pictorial, or even schematic” and is therefore “more rich and sophisticated than most concrete poetry” (34), but I maintain that a close look at the mandates of the early concrete poets can enrich our readings of Howe’s materiality, allowing us to rethink textual embodiment in Howe in a way that avoids the pitfalls of a language of representation, mimicry, and, essentially, icon. The poem-product as useful object makes the speaker, an authorial persona, irrelevant, necessarily distancing voice from the material writing process. In Eikon Basilike, this sentiment is solidified in the small concrete-like fragment that begins the final page: “S i lk” (82), where the materiality of the text, represented here by “silk”—the material product of Ariadne’s art, which is a frequent image throughout the text—is ruptured by the lyric “I,” only to have the lyric subject’s appearance seem disconnected. The “I” is irrelevant to the silk, which continues its weaving uninterested with subjectivity entirely. The constellation in Howe’s work, then, is a broken materiality, a series of connections that cannot and will not form into a tapestry, a coherent whole. This is what Rachel Tzvia Back, in her book-length study on Howe, Led By Language, insists. She writes that “the materiality … of that being broken—whether Howe’s Eikon Basilike or Charles I’s Eikon Basilike—is brought to the fore, examined, and charged with meaning” (123). While the vast majority of criticism gets distracted by the representational potentials (and thus critical goldmines) of a “theme of verbal violence” (142), Back is also concerned with the fact that the materiality of print allows for new and unique, and in my view more powerful, affective connections with the reader. Back writes that “Howe extends the concerns of the bibliographer by not only describing the material object created by print [but] also by considering print’s manipulation of the reader’s attitude toward that material object” (130). In Eikon Basilike, Howe uses a foregrounding of the materiality of language, and a poetics of embodiment, in order to encourage an active reader engagement with her text, turning away finally from the “Lost power of expression / last power of expression” (Eikon 63). She does this in the occasionally pithy way, as in her literal separation via enjambment of the “Nar-/” on one line and the “rative” on the next (67). But, this process is typically carried out in beautiful and nuanced little concrete poems interspersed throughout the text. The most intriguing of these, for my purposes, is “BEhold a mirror” (62), a moment in which the reader’s engagement with the text, and his or her inevitable search for lyric voice and expression, is foiled by the text’s insistence on being read as a useful, material object. The point-of-view of “behold” is disrupted by the shift from capitalization to italicization, rendering the mirror’s reflection immediately fragmented: we cannot expect to see ourselves clearly or cleanly in this text. Instead, the reader is commanded to both exist as and embrace the text’s inability to encompass a point-of-view, or a subjectivity for that matter. At once external to us and ontologically part of us, the text refuses its position as “mirror,” as mimesis, as representation. In its refusal to cohere even on the level of one word’s typography, Eikon Basilike insists that its rewriting is always already rereading, rethinking, and most importantly repositioning. And, in this way, it functions much more like concrete poetry than Dworkin might have us believe. You’re really cooking now! The turn to concrete is an interesting one, especially as you frame it. And I really like your reading of “S i lk,” which is really helpful. 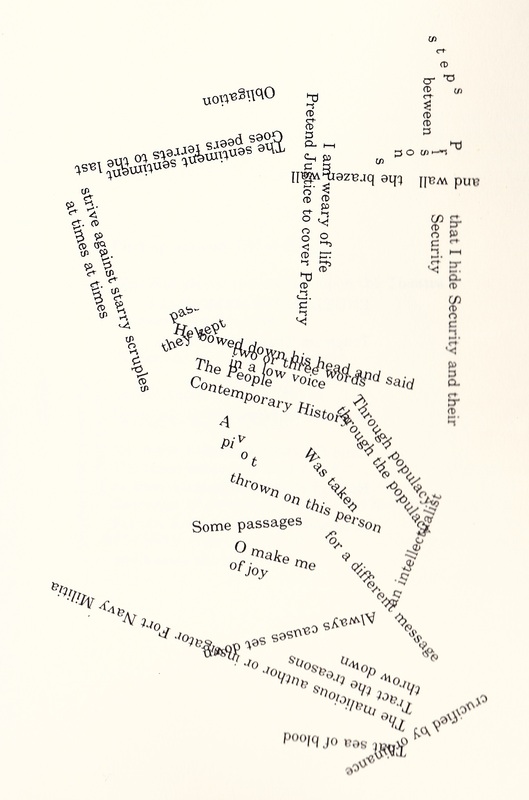 A few thoughts: I was just reading the reissue of Emmett Williams’s _An Anthology of Concrete Poetry_ (), and I was struck by just how often the early concrete poets foregrounded the notion of the reader as a co-producer of the text (they really did establish that idea well before the Language writers). That might be something to mention in this plateau? And your reading of the “BEhold a Mirror” page is really suggestive–but might it go even further? There seems to be a tension between passivity (STay) and action (passenger) which is, in a sense, unresolvable if we imagine a command to “stay put” and “remain a passenger” (though, in a sense, isn’t that what readers do? ), as well as a similar tension between “BE” and “hold” (as well as the command to “hold a mirror”–though, as you perceptively suggest, that mirror reflects brokenly). Or does such an exegetical reading work against your argument in favour of Howe’s text as concrete? All sounds good to me. I’ll get the Williams ASAP and check it out. I was also wondering how the Stay Passenger worked with BEhold a Mirror would work together. I like your reading, and I’ll develop them further in revisions.